and then slice them as thinly as you can manage, removing the cores as well. 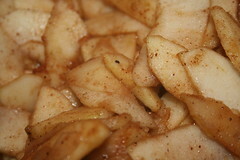 and stir apples, ensuring that they are thoroughly coated with the spice mixture. Return lid to the pot, and cook for another 10 minutes. As the apples cook, prepare the batter. until all ingredients are thoroughly combined. 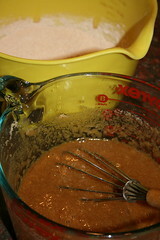 Then add the wet ingredients to the dry ingredients and whisk together until just combined. 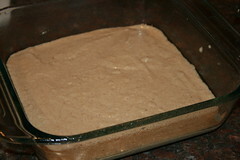 Put one cup of batter on the bottom of a lightly oiled 8x8-inch pan. Spread evenly. Evenly distribute the apples on top of the batter. 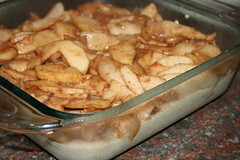 Evenly distribute the remainder of the batter on top of the layer of apples. 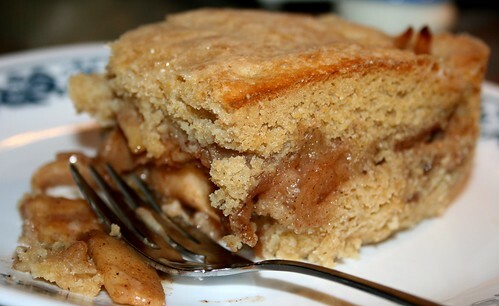 If desired, sprinkle the top of the unbaked cobbler with sugar. I wanted brownies, but I also wanted waffles. 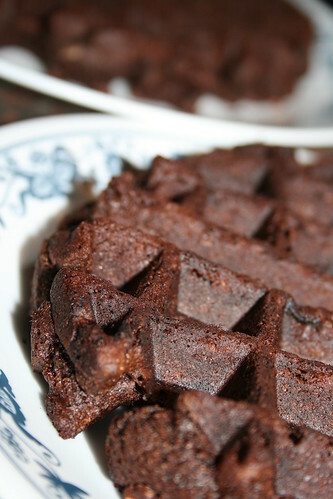 I struck a compromise and formulated a recipe for brownie waffles, with okara acting as a secret ingredient, natch. I was very happy with the way these tasted -- maybe they weren't quite sweet enough, but that's what maple syrup is for, I suppose. The only problem with them was that they were quite "floppy" and difficult to remove from my waffle iron. I use a Belgian waffle iron (worth every penny, but I did have a 20% off coupon, not to mention the fact that I live with someone who was able to fix it when it broke), and if I didn't spray oil on it before pouring in the batter, the resultant waffle would sometimes stick to the top and bottom of the iron when opening it. Waffle irons with more shallow pockets might not have this problem. Having said all this, I was able to have intact, albeit floppy, Belgian waffles; I just had to be very careful when removing them from the iron. Your mileage may vary. In the future I'll be trying to tweak the recipe to create a sturdier yet equally tasty chocolate waffle. This recipe made four waffles with my waffle iron, but in a smaller (non-Belgian) waffle iron it could yield more than that. and stir until well incorporated. Note: Soy milk powder is the "secret ingredient" of my regular waffle recipe, and I swear it makes a huge difference. 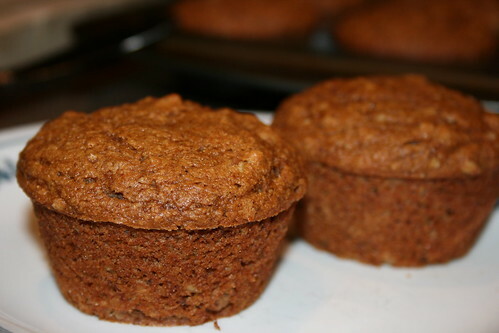 I haven't tested this recipe without the soy milk powder, so I can't say whether or not it's really worth using. If you don't have it already and don't want to buy it, you can probably just omit it and use soy milk instead of water. Or perhaps omit it entirely. and whisk until oil is emulsified. Prepare waffles according to the manufacturer's directions. Rice croquettes, bean croquettes, and now beans-and-rice croquettes. After this, I think my croquette phase will be over. 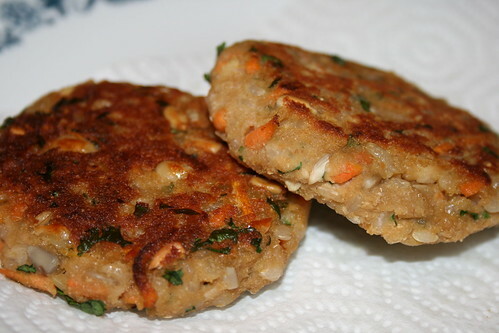 Of the three, the rice croquettes were my favorite, but these were the most tenacious, and just might be able to withstand the pressures of a veggie burger's life. I think I will try eating the leftovers between two pieces of bread with all the sandwich fixings. This recipe makes about six croquettes. into a bowl and smash them up with a fork or potato masher. 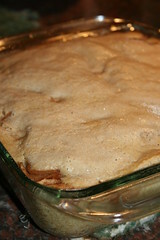 They don't need to be completely pureed; some chunks are fine. 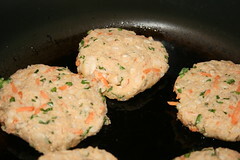 Using a 1/4 cup measuring cup, scoop out 1/4 cup of the mixture and form it into a thin patty (maybe 1/2 inch thick). over medium heat in a pan. Enough oil to coat the bottom of the pan -- not so much that you're deep-frying the croquettes. 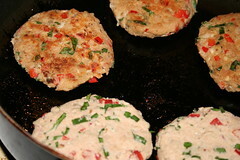 Place the patties on the oil and cook for a few minutes, until that side is golden brown. Then flip them over and continue cooking until the other side is golden brown. Remove from pan and allow to drain on a paper towel. Eat warm. Verdict: The person who thought my last croquettes were "totally bland" thought these were great. I liked them too, although they were a skosh too salty for my tastes. I'm looking forward to seeing how they work out playing the role of a veggie burger. I think they might be even better with kidney beans or black beans, just because those beans seem to have a more distinctive flavor than cannellini beans. 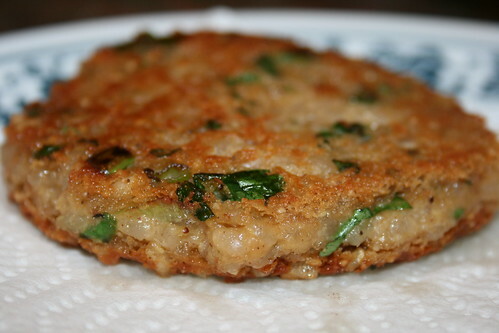 While not as nice as the previously posted okara-rice croquettes, I think these okara-bean croquettes are nice in their own way. I do think they're sort of bland, which is rectified easily enough by a light application of salt. The person I live with, however, deems them to be "totally bland." Perhaps these could benefit from additional seasonings or a doubling of soy sauce. Perhaps this recipe isn't quite "there" yet, but I do think it's worth documenting. This recipe should make about eight croquettes. Verdict: I'm not sure the vital wheat gluten and rice flour did anything that the whole wheat flour didn't already do; they might have been unnecessary additions. Also, I think the whole wheat flour might have contributed to the slight blandness, but it was necessary to dry the mixture out and hold it together. I think some tinkering could be done with the ratio of flour to the rest of the mixture; less flour might bring out the other flavors a little better. 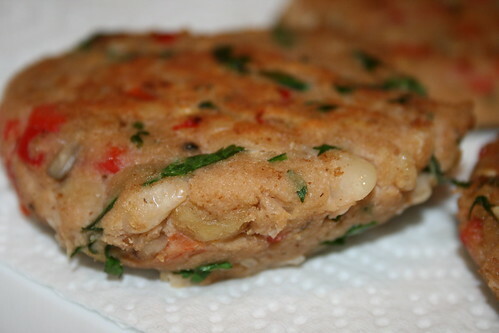 One of my goals is to make an okara-based veggie burger. These are not them. They don't hold together well enough to withstand the pressures inherent in the life of a burger. They taste great, though. I'm not sure how exactly you'd want to eat them. Normally I'd say to eat something like this on a bed of rice, but these are rice. So maybe eat them with a side of vegetables, I guess. Maybe you could even fry them by the Tablespoonful and eat them with noodles (akin to spaghetti and meatballs, sort of, I guess). This recipe makes five small croquettes. Combine ingredients thoroughly, making sure that there aren't big lumps of unmixed peanut butter or clumps of rice or anything else of that nature. 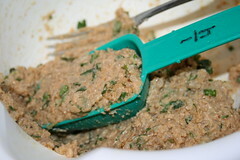 Using a 1/4 cup measuring cup, scoop out 1/4 cup of the mixture and form it into a thin patty (maybe 1/2 inch thick). over medium heat in a pan. Enough oil to coat the bottom of the pan -- not so much that you're deep-frying the croquettes, although if you're really into deep-frying I guess you could do that. 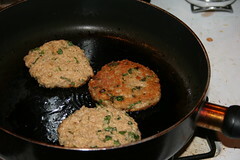 In any case, place the patties on the oil and cook for a few minutes, until that side is golden brown. Then flip them over and continue cooking until the other side is golden brown. I never cared for quiche, but unfortunately, renaming the dish "spinach pie" wasn't enough to save it from the overpowering blandness of underadorned tofu and the underwhelming blandness of the few spices that were present. Over the course of perhaps 90 minutes I was able to eat a modest slice -- it wasn't disgusting, but it wasn't good either. I kept reminding myself that it had a ton of nutrients and protein, not to mention that I was too lazy to cook something else in its place. Before I put the quiche spinach pie into the oven, I tasted the filling a few times, attempting to adjust the seasonings but not quite getting it to my liking. 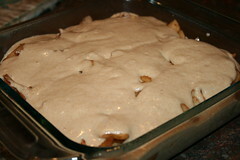 Finally I put it in the oven, hoping that the flavors would be altered for the better by the cooking process. And I think it did taste better after being cooked. But I would still classify this as a failure. I'm not going to post the instructions, just in case someone stumbles upon this recipe and decides to make it without reading my ample caveats. I'll just post the ingredients, so you know what not to do if you attempt to make a quiche with okara yourself. Because regardless of the fact that this particular quiche did not turn out well, I think that okara would lend itself quite nicely to a quiche. It's a good idea, at least. I'm not sure the garbanzo flour was a great idea. I'm also not sure the corn starch was necessary. 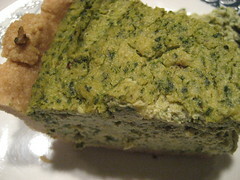 I think the biggest problem was that I used regular tofu, when most tofu-based quiche recipes I see call for silken tofu. I thought the instantly recognizable tofu taste would be overwhelmed by all the other ingredients, but I was wrong. When I bite into this, I feel like I'm eating plain tofu with perhaps the lightest application of other flavors. It was not a pleasant gustatory experience!